4G Energy Service provides sales and marketing representation services to a range of energy industry manufacturers and service providers. 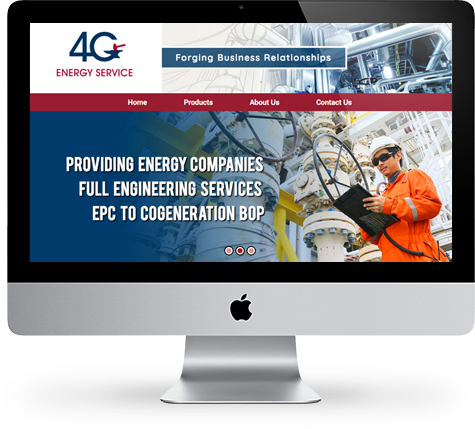 4G Energy Service’s new website showcases a range of products and services as well as provides information about their representation services. The 4G Energy Service staff can update all pages of the website from the cloud based administrative dashboard. Additionally, the website’s responsive design provides excellent user experiences across a wide range of devices including smart phones, tablets and desktop computers. The website is optimized for organic searchability on search engines including Google, Bing, Yahoo, etc. 4G Energy Service staff can monitor website traffic through their online dashboard, measuring online marketing campaign successes. In addition to designing the website, we also host the website and provide ongoing support.